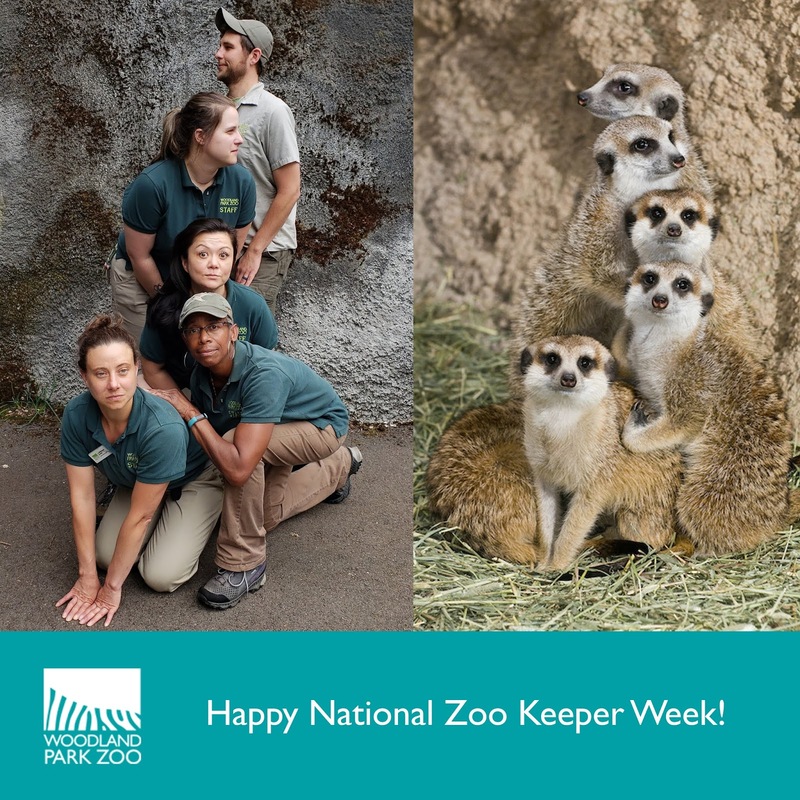 Woodland Park Zoo Blog: Happy National Zookeeper Week! This whole week—which has been National Zookeeper Week—we’ve been celebrating our amazing animal keepers and showing them some love! Looking out for our animals is more than just a job for WoodlandPark Zoo’s keepers. 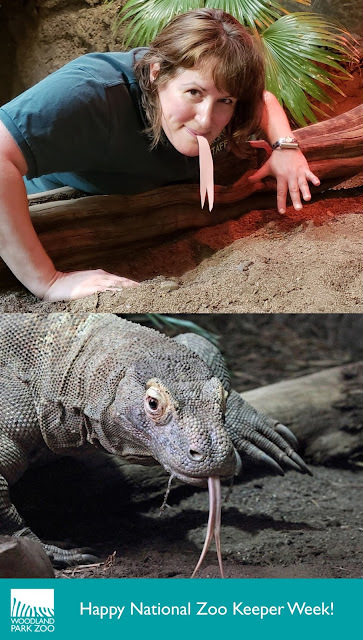 Lead animal keeper Alyssa strikes a very komodo dragon pose. Most of these dedicated professionals consider their critters to be parts of their extended family—a furry, feathered, scaly and hairy family. We would be happy to accept a rose from either Lucy the raccoon or from Regina, one of our awesome animal keepers. 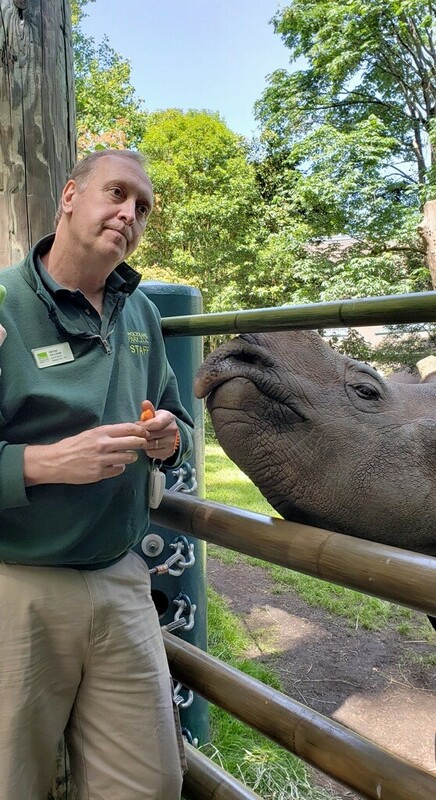 Among Woodland Park Zoo’s animal keeper staff, you will find scientists, researchers, educators, wildlife rehabbers, conservationists and environmental stewards. Christine, Ros, Carolyn, Jenna and Drew make for the most marvelous meerkat mob. 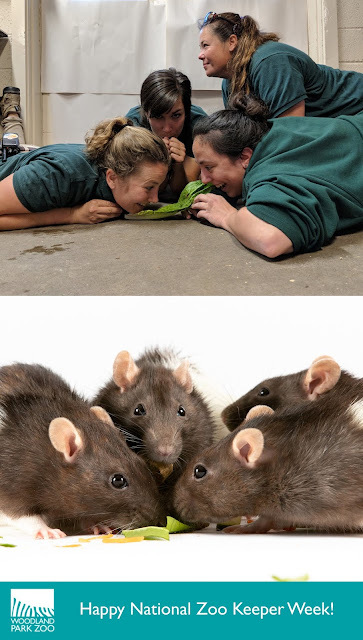 They represent the heart and soul of what we do, caring for our animals, providing our guests with amazing experiences and just generally being awesome. 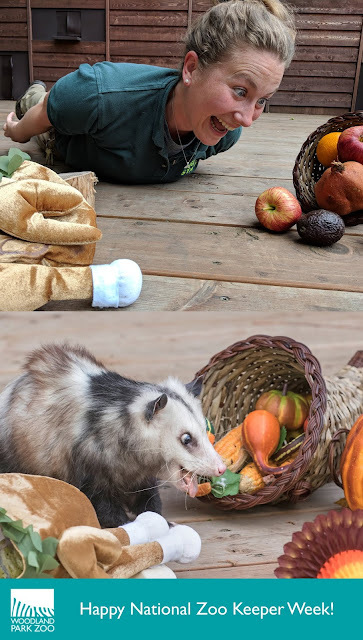 We can't tell who's more excited about getting a basket of fruits and vegetables--opossum Penelope or animal keeper Rachel. This dedicated group of professionals is passionate about conservation and animal welfare, and they love talking to zoo guests about the animals they care for. Our ambassador animals, like these rats, know that sharing a snack with friends is fun. Our keepers Rachel, Susie, Regina and Erin know that, too. Many of them are also incredibly funny, as you can see here, where they’re having fun recreating some of their favorite animal photos. Keeper Carolyn is echoing a pose of Malayan tiger Eko, in a training session with Christine. This week is also when our keepers come together to honor one of their own with the annual Excellence in Zookeeping Award. Congratulations, to penguin keeper Celine! Thanks for taking such good care of these beautiful and boisterous birds. 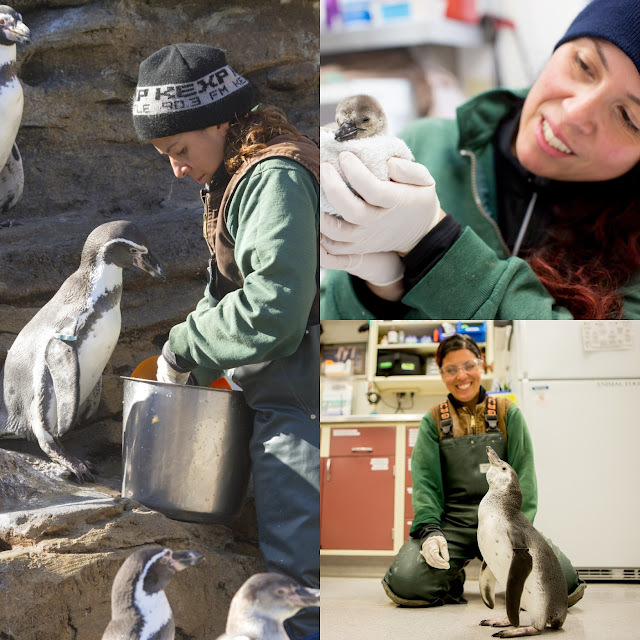 This year, that award goes to Celine Pardo, an animal keeper at our award-winning Humboldt penguin exhibit. Ironically, Celine—who has been at Woodland Park Zoo for 12 years—wasn’t even here to accept her award in person. She is in Peru at Punta San Juan, the rugged South American coastal reserve that is home to nearly half the wild Humboldt penguin population. She’s working there, with our conservation partners, to help with ongoing research into the health of the population of these endangered birds. Stay tuned. We’ll be sure to tell you more about her trip when she returns. Is animal keeper Peter copying Taj's facial expression, or is it the other way around? Taj is a very smart greater one-horned rhino, so it really could go either way. 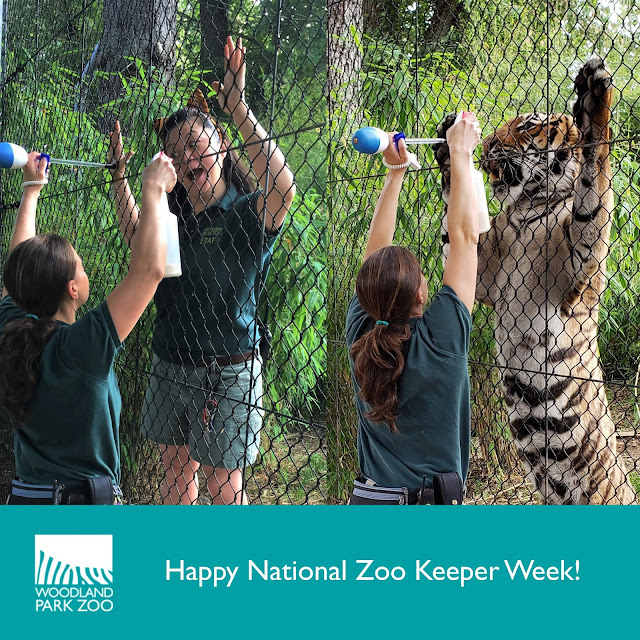 We’d like to honor ALL our animal keepers. Thank you for love, enthusiasm, passion, empathy and dedication that you bring to your jobs every day. 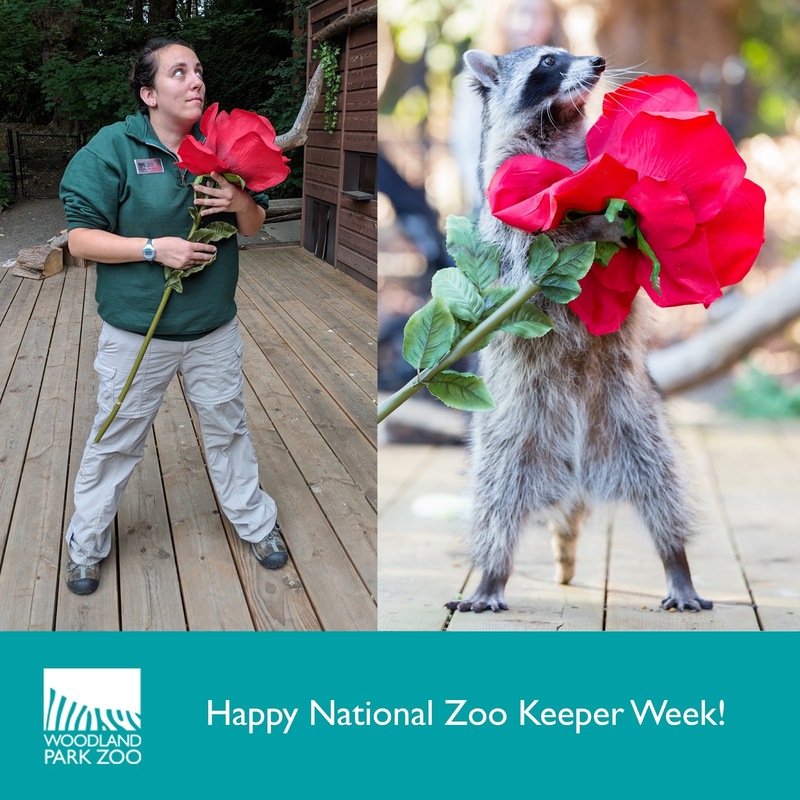 Plus—let’s just come out and say it—you all have the coolest jobs and are the true rock stars of Woodland Park Zoo.